Mark your calendar! The Black Lives Matter at School action this school-year will be held from February 4-8th, 2019. Black Lives Matter At School is a national committee educators organizing for racial justice in education. We encourage all educators, parents, students, unions, and community organizations to join our annual week of action during the first week of February each year. If you or your organization would like to support or endorse the week of action, please email us at: BlackLivesMatterAtSchool2@gmail.com. 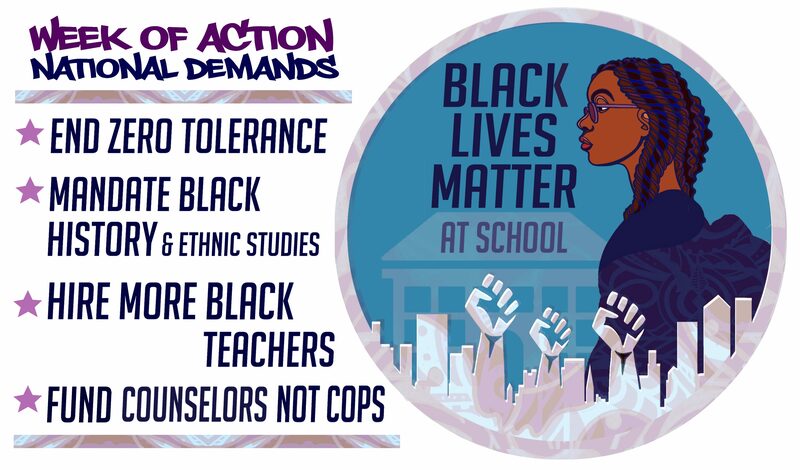 During the 2017-2018 school year, from February 5 to 9, thousands of educators around the U.S. wore Black Lives Matter shirts to school and taught lessons about structural racism, intersectional black identities, black history, and anti-racist movements for the nationally organized Black Lives Matter at School week of action. Educators in over 20 cities participated in this national uprising to affirm the lives of Black students, teachers, and families including, Seattle, Philadelphia, Los Angeles, Chicago, Detroit, Boston, New York City, Baltimore, Washington, D.C., and beyond. With your help, this year’s BLM at School week of action can be even bigger and have more of an impact. Let us know what you are planning for BLM at School week this school year or ask us how to get involved with the action by emailing us at: BlackLivesMatterAtSchool2@gmail.com.